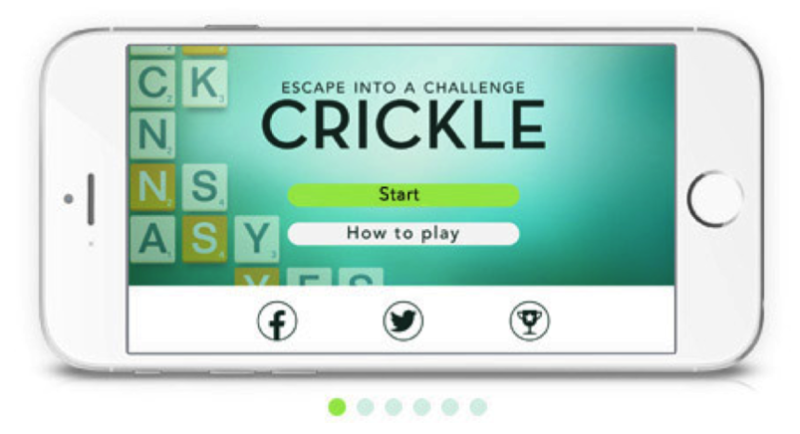 Oxford, UK – 1 February 2017 – Oxford based games company, Crickle Ltd, announces the forthcoming launch of Crickle, an exciting new word game for solo play on mobile phones. Launching in Android and iOS app stores on Friday 3 February 2017, Crickle will delight word lovers and is good news for people of all ages: never-ending word fun is now only a few taps away! Forget your crushed train carriage , your windy bus stop, the queue for an appointment and love the person who makes you wait; it no longer matters because you have Crickle. Escape into a challenge! Playing Crickle is an interesting experience as it pulls at the brain in a new way. Play is endlessly varied. You’ll be playing in minutes, but you’ll improve over weeks and months. Enjoy pre-set games Fun and Challenge or configure your own game. Games tend to take between two and ten minutes, but you’ll probably hit ‘play again’. Post scores to Facebook, Twitter and the Leaderboard. This is word wallowing at its best. Lovers of the english language world-wide! 15 free plays before you buy – see if you like it! In-app purchase necessary to continue play and access configurable games. Excellent website at cricklegame.com which offers lots of useful information including full guidance on how to download an app for those who are new to apps. The word Crickle is ‘old english’ for ‘stream’ – a reference to the way the words stream down the screen. Invented in Oxford, Crickle was made in Birmingham. Crickle Ltd is a member of TIGA, The Independent Games Association.